Seoul: The death of Apple’s inspirational leader is likely to have a deep impact on the maker of the iPod, iPhone and iPad, giving major rivals a greater chance to catch up with the technology giant. Steve Jobs’ creative spirit was so closely tied to the fortunes of Apple that his death raises questions about the company’s ability to keep its pipeline of transformational products running at such a fast pace. The CEOs of rivals including Samsung Electronics , Amazon , Google and Sony mourned the death of Jobs, a sign of the respect they held for the Silicon Valley legend. Jobs, who was 56, had fought a long battle with pancreatic cancer. In August, the man known for minimalist design and marketing genius handed the reins of Apple to long-time operations chief Tim Cook. “Apple no longer has someone as creative and ambitious as Jobs that they can rely on," said Simon Liu, deputy investment officer of Polaris Group’s fund unit. Cook unveiled the latest version of Apple’s iPhone this week, in a launch that, unusually, failed to wow fans. In a sign of stiffening competition, Amazon.com Inc took the wraps off its Kindle Fire tablet last week, tacking on a mass market-friendly $199 price tag that analysts said poses a serious threat to the dominance of the two-year-old iPad. Analysts have said the South Korean conglomerate is one of the best placed companies to deliver something fresh and exciting to rival Apple. Samsung produces the closest competitor by sales to Apple’s iPad tablet. The two companies are scrapping for top spot in the smartphone market, having overtaken Nokia , the market leader for the past decade, in the second quarter. Apple is also Samsung’s biggest customer through the sale of mobile chips and display screens. The relationship and rivalry has helped Samsung become a top global brand over the past decade with a stock market value of $115 billion -- still modest compared with Apple’s $345 billion. But the relationship has also produced tensions over mobile devices. The two companies have sued each other in 10 countries involving more than 20 cases since April. Samsung’s Galaxy range of smartphones and tablet computers run on Google’s Android operating system. “Steve Jobs was particularly passionate about the enforcement of Apple’s intellectual property," said Florian Mueller, an intellectual property expert. “From a strategic point of view, Mr Jobs’ successor doesn’t have a choice other than to fight equally hard." Jobs had few kind words for his competitors. Rivals were “flummoxed" by the iPad, he declared in March when he took the stage to unveil Apple’s latest tablet. “They went back to the drawing boards. They tore up their designs because they weren’t competitive," Jobs said. “Under Jobs, Apple consolidated segmented IT sectors into one big consumer market and claimed so many victims," Lee said. “Without Jobs, Apple’s rivals now have some time to step up and majors such as Google, Samsung, Microsoft and Facebook will try to fill the gap." The iPhone -- introduced in 2007 with the touchscreen template now adopted by its rivals -- is the gold standard in the booming smartphone market, and its sales have dealt a blow to ambitious plans of many competitors. “The question is whether it can continue to launch iconic and successful products without him (in the longer term)... In the longer term, Apple risks becoming a more ordinary company without him." 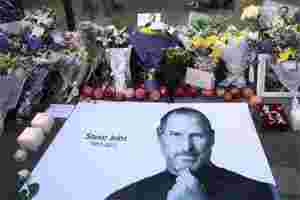 Jobs’ influence was underlined by the outpouring of tributes from executives of the world’s biggest companies. “Chairman Steve Jobs introduced numerous revolutionary changes to the information technology industry and was a great entrepreneur," Samsung chief executive G.S. Choi said in a statement. Howard Stringer, the chief executive of Sony Corp said: “The digital age has lost its leading light, but Steve’s innovation and creativity will inspire dreamers and thinkers for generations." Apple announced Jobs’ death after the launch of the new iPhone 4S. Investors and some analysts said the disappointment to the phone marked a rare loss of momentum that could give rivals room to push their products. “Jobs was an outstanding CEO and his successor Tim Cook faces a test (as to) whether Apple will be able to lead the global market as it was before," Lee Jun-hyuck, a fund manager at Dongbu Asset Management. On Thursday, Samsung’s shares rose 1.5%, LG Electronics advanced 6.3 % and Sony rose 4.7% as part of broad gains in Asian markets. Phones based on Google’s Android, which is available for free to handset vendors such as Samsung, HTC, LG and Motorola , have a greater combined market share than Apple’s iPhone, which is still the world’s No. 1 selling smartphone. “Apple faces big challenges with the loss of Jobs and that will offer other technology companies opportunities to challenge its supremacy," said Lee at Shinyoung.